Zentangle® Art - Now What Is That? Bonnie has always enjoyed drawing and now she is a Certified Zentangle Teacher®. Zentangle® is an easy-to-learn method of creating beautiful images from repetitive patterns. Learn why this new art form is so much fun to do and relaxing. How does it increase your focus and creativity? Zentangle requires no drawing skills and can be enjoyed by any age. "Anything is possible...one stoke at a time" ™ 1 hr. Are you at the very end of your quilting project and discover it isn't straight? What happened? Learn what factors, from the design phase to the last stitch on the binding, that affect your quilts being square and flat when you are finished. The goal of this lecture is to familiarize the quilter with the choices one makes and the effect those choices have on their quilts. 1 hr. For a 3-hour lecture/demonstration, bring a quilt that needs help for the discussion portion of the class, and note taking supplies. All levels. Quilting is truly an international language these days. Even with language barriers, we quilters understand using needle and thread and our sewing machines to piece together quilts. Take a PowerPoint journey with Bonnie as she looks at some of the countries she has visited as a quilting instructor -- Australia, Turkey, Japan, Canada, Switzerland, and Indonesia. See our quilts, how we live and eat (yes, you'll see some of the food that she has shot - with her camera, of course), and how we are alike and different. 1 to 1 1/2 hours. Good program for non-quilters too. How are quilters alike across the U.S. and around the world? How are they different? Journey with Bonnie Browning and she will show you images in a PowerPoint. Learn some of the glamorous, including meeting a real live Princess, and not-so-glamorous things that happen to a quilting instructor. It's fun and you'll see some great quilts too! The 6,000 Mile Quilt... or Whatever Happened to Those Old Blocks? What do a designer from Revere, Massachusetts; 50 quilt blocks from WW II; embroidered names; a computer search; and a quilter in Paducah, Kentucky, have in common? Learn the story of this special quilt and its 6,000 mile journey to completion. Bonnie and this quilt were featured in an HGTV Special Program called, "Quilts: Secrets Hidden in Fabric." 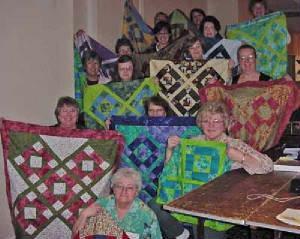 Learn what quilters are doing to construct their quilts. Using a PowerPoint, Bonnie shares examples of the latest trends and techniques. You will leave inspired! 1 hr. This lecture is revised every time I give it...always something new! Quilting, past and present, is the focus of this lecture and it includes a historical review and slides of the types of quilts made by our grandmothers and those being made today. Quilts will be displayed to show the variety of designs available. 1 hr. After judging your quilt show, Bonnie will discuss what she saw in the quilts in the show, including areas of expertise and areas that need improvement (in general terms - not specific quilts); share some ideas for correcting problems, and answer questions from quilters. Can include a walk-through of the quilts if held at a time when the show is not open; that's a great time for guild members to ask questions. 1 hr. Click on the link on the top of this page for my workshops on Zentangle Art. This page lists the workshops and lectures that I am currently teaching. See my Schedule (the link is on the left of this page) for my committed teaching dates. A minimum booking of one lecture plus two 6-hour workshops are required if more than 3 hours of travel is involved. Please e-mail or call (270-898-4065) to check my availability for your guild or conference. Contact Bonnie by e-mail (bbquilter@gmail.com) for fees and scheduling information. Use just four fabrics for the star plus a background and you can make the basic Lone Star. Learn the tricks for taking the mystery of how to get your seams to match up, rotary cutting, and how the color placement changes the star design. 6 hours. Sewing machine required. All levels - know how to use your sewing machine to sew accurate 1/4" seams. Once you have made a Lone Star for the center of your quilt, what can you do to add more design elements to the quilt? See a variety of options for the corners and side triangles. We will made a wallhanging and you'll design which layout option you want to use for your quilt. 5 hours. Sewing machine required. All levels - know how to use your machine to sew accurate 1/4" seams. This class has a variety of items that you can use or give as gifts - Bonnie's dogbone pillow, potato bag, and pillow for breast and chest surgery patients to use with their seat belts in the car. This is a fun day of sewing. All of these items can be made for gifts or for selling in your guild's bazaar (not for other commercial selling though). I'll even show you how to make a patchwork sling! All levels. Sewing machine required. This new class combines Paintstiks and batiks with Pojagi-style patchwork for a fun day of painting and sewing. You'll experiment with Paintstiks and learn a new method of stitching patchwork. No experience necessary. 6 hours. Can be done by hand or machine. 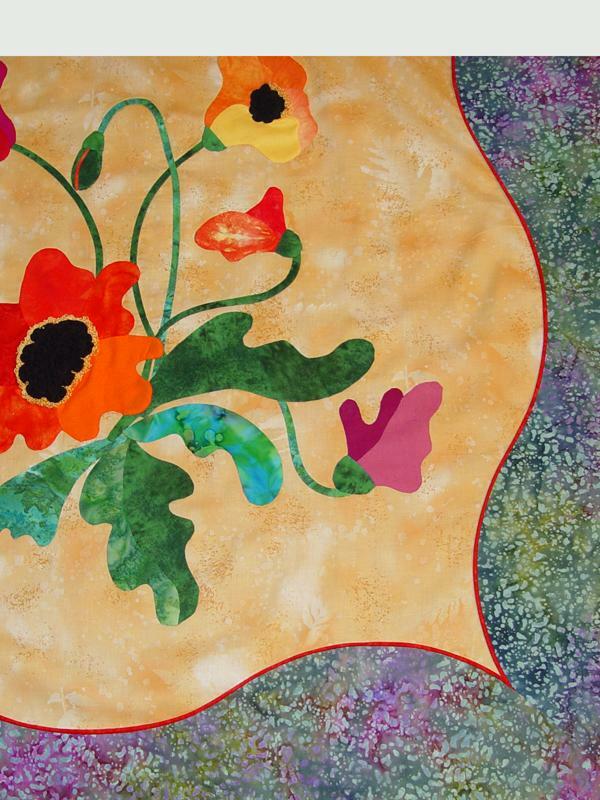 Make a sampler of ideas for finishing the edges of your quilts or garments. From traditional French binding to a variety of piped binding treatments, Hong Kong edge, and novelty treatments like fuzzy raw edges and fluffy binding. We'll even try out a raw-edge fused binding that might be perfect for that next quick project. Beginner/Intermediate. Sewing machines required. 6 hours. Starting with 12" Nine-Patch blocks, we'll whack them up and create a great design without sewing any little pieces together. Just choose three color families -- you can use three fabrics or make it scrappy by choosing several pieces in a color family. Add some solid fabric for accent and you have a smashing quilt. Come enjoy a day of easy sewing on a fun project. All levels. Sewing machine required. 6 hours. Prairie Points add a fun edge to a quilt. Learn to make them as single units, stacked, and in a continuous strip. Best of all, you'll learn how to make them fit the edge of your quilt, using Bonnie's no-math method. Demonstration of piped prairie points too. All levels. Sewing machine required. 3 hours. $2.00 handout fee. Binding - What's Old & What's New? Do you like the traditional double binding on your quilts? -- we'll make a sample. Then, we'll make a piped binding, and some fun novelty bindings from fuzzy to fused, and the two-sided binding (shown below). Jazz up those bindings of your quilts. All levels. Sewing machine required. Play with the traditional Nine-patch pattern. We'll make strips in different sizes and combine them in different ways to give exciting new designs from this old standby pattern. Choose your favorite two colors and come have some fun. All levels. Sewing machine required. 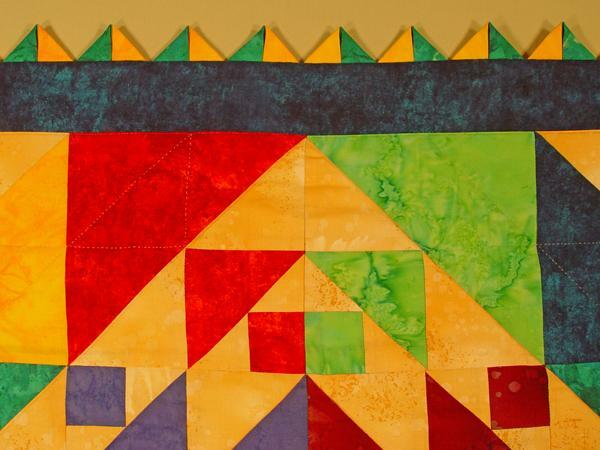 Learn the secrets for using a triangle shape to make this terrific Windmill Quilt. This quilt has been shown at the beginning of the Simply Quilts program and requested by many viewers. Learn to draw and sew the triangle and other shaped Log Cabin blocks. Sewing machine required. Helpful to have some paper piecing experience. 6 hours. $12.00 fee for 32 prepared foundations. Patriotism is nothing new to Bonnie. A flag has been a permanent fixture on the Browning home for years. This workshop was inspired by some WW II blocks that were given to her. 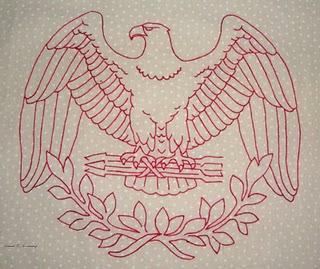 An old technique of combining embroidery with applique adds to the charm of this block that features Lady Liberty and Old Glory. 3 hrs. Need some experience in applique. Hand. Decorate quilts, clothing, towels, and other sewing projects with classic embroidery stitches. In class we will work on a sampler to try out a variety of stitches. Make it into a pillow or frame it later. This is a great class for someone wanting to learn embroidery or who wants a good refresher course. 3 hours. All levels. Hand. Learn to make double ruched roses from circles (Bonnie's way), applique by hand or machine, and make easy stems while working on this 18" block. Four blocks with a Shark's Teeth border makes a great wallhanging. Intermediate. 3-hour workshop -- block techniques/6-hour workshop includes Shark's Teeth technique. Hand (machine is optional). This heart-shaped design with mistletoe and holly combines bias stems and hand applique to make a great wallhanging. Learn Bonnie's method of hiding those applique stitches! Learn the art of making your borders fit the edges of your quilt...every time... and what you can do to make them lay flat and be straight. This lecture/demonstration includes many tricks for adjusting patterns and using paperfolding techniques for accurate borders. See how to make prairie points (several ways) for decorative edges and Shark's Teeth or piping (shown below) for a more sophisticated decorative border. 6-hour workshop, stitch a border on a small quilt. All levels. Hand or machine (optional). $2.00 handout fee. Make the Sawtooth Star block in this easy, rotary-cut, graphic quilt. Perfect project for beginners, young and old, to learn to quilt. Looks great in red, white, and blue too. 3-hour workshop - learn the techniques or 6-hour workshop - nearly finish the top. Sewing machine required. Learn how to add the beautiful border called Shark's Teeth to your quilts. You'll be amazed at how easy it is to do. The teeth make a great inner border or add a complete set of teeth on both sides of the border edges. 3 hrs. All levels. Machine optional. Square In a Square - Make this quilt in class in a day! You don't need to make 20, 30, or more blocks to make a quilt. Using only four blocks, borders and large-scale piecing of design elements from the center make a quilt for a wall or bed. Techniques: corner squares, half-squares, mitered corners. Beginner/Intermediate. Sewing machine required. 6 hrs. 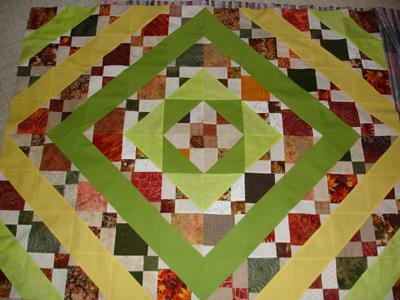 This quilt has five different borders - good way to show off four blocks and add borders to make it a bed-sized quilt. Make paper-pieced dogwoods using Bonnie's original design called Paducah Dogwoods; you see this design on the banners and Dogwood trail signs in Paducah every spring. Intermediate level/some knowledge of paper foundation pieced is needed. Sewing machine required. 6 hours. $3.00 for prepared foundation patterns. Taking tips from our forbearers, have fun working with scrap fabrics from your own collection; this is a project to use up fabric -- do not buy more. Using squares and triangles, explore color and design possibilities by fabric and value placement. Enjoy seeing the many designs you can make with the blocks. All levels. Sewing machine required. 6 hrs. Fun day = Taking a workshop with Bonnie Browning.